How do we respond to natural disasters? What comes to mind? Large relief organizations like the American Red Cross? Or perhaps the Federal Emergency and Management Agency? Well, those images are certainly part of the story — but they’re not the whole story. In our new podcast series, The Response, we aim to share a perspective that isn’t extensively covered in the mainstream media. Specifically, we ask the question: how do communities come together in the aftermath of disasters — often in the face of inadequate official response — to take care of each other? In the first episode of this series, we answer that question by taking a deep dive into the Rockaways Peninsula in New York City, to explore how, in the immediate aftermath of Hurricane Sandy, a grassroots network of activists and volunteers emerged to coordinate one of the most effective relief efforts in the city. 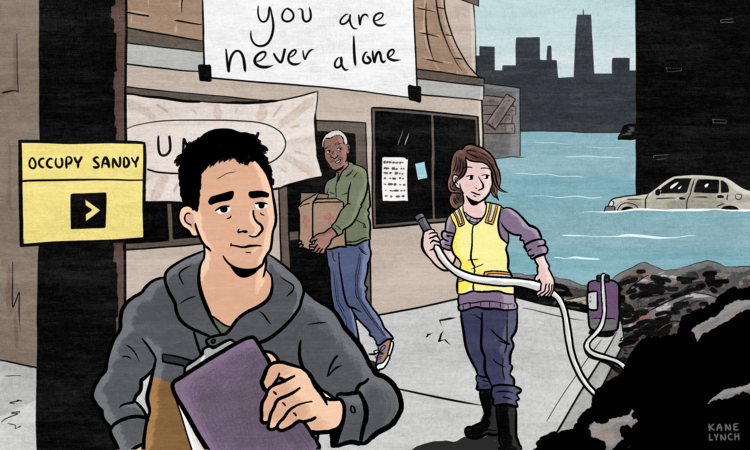 The group became known as Occupy Sandy, and in this episode, we tell their story, focusing on the personal narratives of three New Yorkers who were thrown into this spontaneous relief effort. We’ll explore how, in the midst of the unfolding catastrophe, unlikely friendships were formed, deep bonds were cultivated, and a perhaps dormant side of New York City was awakened — one based on collectivity, mutual aid, and solidarity. For a full list of episodes, resources to cultivate resilience in your community, or to share your experiences of disaster collectivism, visit www.theresponsepodcast.org. Below is a transcript of the episode, modified for your reading pleasure. Sal Lopizzo: I’ve lived in the Rockaways now about five years — but the night of the storm I was in Queens. And I was on the phone with one guy that I knew that had stayed, but he’s up on the second floor and he was giving me a minute-by-minute, “Oh my God, there’s a car floating down in the street right into your office.” He says, “The block is on fire.” So I’m trying to imagine this in my head. It was horrific. But I — I don’t know, I…for some reason, I didn’t — I didn’t despair. I don’t know, even when I think about it now, like, would I have rather not had Hurricane Sandy? Of course. But, look what happened. Tom Llewellyn: Sometimes there is a gap. A space that opens up. A break in the flow of day to day life that well, it kind of changes everything. It’s like…you know when your deepest pain somehow transforms into your brightest insights? Or when the thing that you feared the most turned out to be your biggest teacher? It’s something kind of like what the poet and songwriter Leonard Cohen once wrote, “There’s a crack in everything. That’s how the light gets in.” Well, this is a show about those cracks. And the light that shines into them. It’s a show about rupture… about disaster — actually literally about disasters: like hurricanes, wildfires, earthquakes… What can they teach us? What do they reveal? I’m your host, Tom Llewelyn, and you’re listening to The Response. Today we tell a story about New York City — well, actually, it’s a story about what lies beneath the surface of New York City. On the night of October 29th, 2012, when Hurricane Sandy made landfall in the Rockaways, the borough in which this episode takes place, thousands of people had their reality, well… cracked. This episode is the story about that crack, and about how the light poured in for those thousands of people throughout the city, including a guy named Sal Lopizzo, whose voice you just heard. It’s a story about unlikely friendships, radical recovery efforts, and, what you might call disaster collectivism. Sal Lopizzo: Careful, watch out for the pole [laughs]. Tom Llewellyn: It’s a grey and misty day in June, and we’re walking down Beach 113th Street in the Rockaways with Sal. Sal Lopizzo: So right now, this whole area was totally devastated, right? This place here is a nursing home, and the sad part of it is that everybody on the first floor was not evacuated, so we really don’t know the truth about who drowned and who didn’t. Tom Llewellyn: When Hurricane Sandy barrelled into New York City, it left a trail of death and destruction in its wake. Fifty-three people died. Thousands lost their homes. Sal Lopizzo: This was all flooded, cars were floating, the boardwalk was on the street. It was — you know, it was a wooden boardwalk — it was totally blown away. There was nothing left but a skeleton of concrete that was supporting it. Tom Llewellyn: The Rockaway peninsula is a narrow strip of land lying along the coast south of Brooklyn. It was hit especially hard by the storm, and because it’s so removed from the rest of the city, official rescue efforts were dangerously delayed. Sal Lopizzo: Yeah, the street was covered with a foot of sand, garbage, everything just floated right down — the boardwalk was destroyed. It really is heartbreaking. You know, some of it you don’t even want to remember. Tom Llewellyn: Born in the fifties to a working class, immigrant family with ten children, Sal dropped out of school pretty early on. He did construction work at first, but, later, in his twenties, he got caught up in some illegal activities — jewelry store robberies, bank robberies, that kind of thing — which ended up landing him in prison with a fifteen year sentence. But, in an interesting twist, that’s where his life began to transform for the better. Sal Lopizzo: So because I was in a cell, I turned it into a cell like a monk. When I look back on it, it was like a time for me to really indulge in books, understand politics, understand life, understand myself. Really was a good time for me to understand myself, and where I fit in in the planet and get me ready for when I got out. Tom Llewellyn: So, fast forward about 30 years to early 2011. It’s a year and a half before Sandy hit, and Sal’s been out of prison for a while now. He’s been working to open a center in Rockaway Park to train residents in trades like solar installation. Sal Lopizzo: The goal was a workforce development training center, because I felt like this area was an opportunity to teach people that don’t have degrees, teach people that don’t have academic backgrounds, how to get into mainstream. How do you get into mainstream? Very simple. You learn a trade. So that was my goal. I saw Rockaway as a disaster zone. There’s a lot of disaster zones around New York City — around the whole country for that matter — but I live in New York City. So you can go into certain areas and you actually see a disaster. You see a woman trying to get money so she could buy diapers for her child. So that’s disaster. We’re living in a disaster area. These people are in isolated disaster areas. Whatever the causes that got them to that point — that’s where it’s at. And I saw that here in Rockaway and I felt like I could make a big difference. Tom Llewellyn: Sal poured all of his time and energy into getting the center up and running. He was paying rent, getting supplies, building walls, all that kind of stuff. It took a lot of work, but after about a year and a half of prep, he finally got the center open. He was even able to run a seminar or two for a couple of weeks. And then Sandy hit. Sal Lopizzo: Before it hit I wasn’t that concerned. I thought it was just another storm coming and me and a friend of mine went up to the beach and we just started collecting sand, making sandbags — we’re only one block away from the ocean. But then when I saw the storm itself, and felt it, I knew that we had to get out of here. It was just a really dark, dark sound — the wind was like a growl. The ocean was growling. It was, it was devastating. Tom Llewellyn: All Sal could do was to put up some sandbags, board the place up, and hope for the best. But when he came back the following day, it was obvious that his efforts had been in vain. And they were from Occupy Wall Street — so we dubbed it Occupy Sandy. And from that moment on people just showed up, gutted the office out, got everything out into the street. We started putting up tables, we started serving breakfast — put a big sign up. Trucks just started showing up with supplies. Any supply you could think of. If you walked into Home Depot or into a Target store, it was in this office. Tom Llewellyn: Sal was suddenly thrown into something much larger than he could have ever imagined. Almost overnight, his space was transformed into a relief hub and community service center which became known as YANA, which stands for, “You are Never Alone.” Fortunately, this kind of thing wasn’t unique — dozens of similar hubs began to pop up in heavily hit areas, in a spontaneous phenomenon that became known as Occupy Sandy, a community-driven relief effort that filled a vacuum left by the official response, and which grew out of the networks and strategies developed by the Occupy Wall Street movement. Occupy Sandy volunteers worked in partnership with local community organizations and activist networks, and their grassroots efforts focused on empowering poor and working class communities. With nearly 60,000 volunteers at its height, its own online relief registry, a legal team, a medical team, a team of translators, prescription drug deliveries, and serving around 20,000 meals a day, Occupy Sandy is considered one of the most effective relief efforts in the city. Sal’s immersion in the community that spontaneously formed after Sandy gave him a new sense of possibility. This is a situation that people often find themselves in during the aftermath of disasters. This falling away of everyday normalcy opens up the space for the creation of unlikely connections. Terri Bennett: When Hurricane Sandy hit I was living in Fort Greene in Brooklyn. Tom Llewellyn: This is Terri Bennett. Terri Bennett: We were out earlier in the evening and we were kind of out in the storm for a little while and then we just kind of went back to my house which is located on top of a hill and [laughs] we played cards, we were drinking, and I think I had gone to the store and gotten some like beans, beer, and toilet paper to stock up in case anything out of the ordinary had happened. Which in retrospect was not really a solid emergency plan but at the time it seemed to me what I should do. The next day when we woke up, we were looking at the news and the first thing I actually saw — I’m originally from New Jersey — was I saw images of the Jersey Shore and the really iconic image of the roller coaster that was in the ocean. And that was the first indication that something really serious had happened. Slowly I started hearing about different kind of relief efforts — primarily people establishing distribution centers and people starting to get donations together. And at the time we had a fifteen foot cargo van that was empty, and we had a full tank of gas. So we went to one of the distribution points which turned out was operated in part by Occupy Sandy. And so we took the first van load of stuff down to the Rockaways. Tom Llewellyn: The distribution point in Terri’s neighborhood directed her to a specific relief hub on the Rockaway peninsula. Terri Bennett: Where that place turned out to be was a place called YANA, which stands for “You are Never Alone,” and which was Sal’s nonprofit that was destroyed after the storm, and so that’s where we went every morning for a long time after the storm and there was kind of a joke that I had like a little traveling office because I had like tote bags with a bunch of different clipboards in it with a list of every house we’d been to, and the people, and how many people lived in the house, and how old the people were who lived in the house. Tom Llewellyn: Terri already had a background in marshaling relief efforts and she quickly became an important part of the recovery process, creating an organization called Respond and Rebuild, which was one of a handful of projects that formed the Occupy Sandy network. In addition to pumping and gutting flooded homes, Terri specialized in coordination: what volunteers and supplies needed to go where and in what quantity, the kind of thing that’s always changing moment to moment. This was the sort of thing that Occupy Sandy actually excelled at, despite — or perhaps because of — its loosely organized and flexible structure. Terri’s project alone logged well over 40,000 volunteer work hours and worked on over four hundred homes. She put an incredible amount of time and energy into actually making personal connections with the folks she was helping — and she wasn’t afraid to get her hands dirty. Terri Bennett: When we were first driving around we just had this huge neon yellow van that has a sign that said, “We can pump you out,” I think. And it just had my phone number. And so right across the street from YANA was a couple who was a retired cop and her husband and we’d heard that they had water in their basement and so we kind of pull up with this big yellow van looking like we looked, which was like we hadn’t slept for days or showered or changed our clothes, you know. We show up and we’re like, “We heard you need your basement pumped out?” And we pumped their basement out and it was the first house that we pumped out. And so this couple turned out to become friends of ours — and kind of unlikely friends of ours. I don’t have a lot of friends who are retired cops. But, I don’t know, yeah. Just — I, we developed a lot of unlikely friendships and we had a situation where we had this kind of unlikely group of friends who were really appreciative of all the volunteers who were coming down and started — you know they’re just — they’re people whose home was just destroyed after a disaster and they decided that they really were invested in having these volunteers well taken care of. And just, I guess the kind of people they are, right? But they started having just a cooler on their front porch that constantly had like sodas, and water, and they had bagels, or they had pizza that they would just leave on their front porch that volunteers could just come and eat, you know? And despite the fact that their home is just been destroyed they’re actually just also taking care of us. And then at one point in time we were hanging out afterward. You know, she said to me, “A month before the storm if I would have seen people looking like you, I wouldn’t have given them directions for the train. But then a month after the storm I’d given you keys to my house.” And I think those kinds of experiences really changed how I experience New York. And like, what my community in New York meant. And it really kind of diversified what my community in New York meant. Tom Llewellyn: Occupy Sandy wasn’t your average relief effort. Instead of seeing themselves as a charity organization, Occupy volunteers saw themselves as participants in a process of mutual aid, a concept that rejects the savior/victim dichotomy that often exists in relief work, and which instead emphasizes working with communities in a horizontal way, blurring the line between what we traditionally consider to be victims and volunteers. Terri Bennett: I really felt that it was important that we put the affected people’s experience first. So asking people what they needed and asking people what they wanted and asking people how they wanted that to work. It was really important to me that this huge outpouring of concern and willingness and labor was accountable to the people who needed the help, right? And so I think a lot of the reason we were able to sort of connect with people and have our efforts kind of snowball is that, like, we had these like little clipboards but we weren’t asking you to fill out a form and we weren’t doing something that felt impersonal and we weren’t stopping you from telling us what was going wrong because there’s no box to check off. And we just listened. And so if what you’re going for is mutual aid, some kind of like mutual recognition is the first thing that’s required. Tom Llewellyn: This kind of approach couldn’t be more different from the relief efforts organized by institutions like the Red Cross or the National Guard. despite having played a key role in supporting many people who were impacted by the storm, these organizations could have been much more effective if they had worked in closer partnership with the groups under the Occupy Sandy banner. Unsurprisingly, there was a lot of tension between Occupy volunteers and the official relief efforts. This might have had something to do with Occupy’s connection to radical politics and the different interests that are represented among grassroots versus official relief. In fact, a lot of the time, disaster recovery can be aimed at simply restoring the status quo as quickly as possible, or worse, at taking advantage of shocked communities in order to advance an unpopular agenda. But in areas like the Rockaways, the status quo wasn’t working for most people. So instead of limiting their efforts to getting the existing social order back into gear, Terri and the folks at Occupy saw the disaster as an opportunity to let the light shine into the cracks that existed in the Rockaways far before Sandy ever hit the peninsula. They wanted to harness all of the energy created after the disaster in a way that could empower the community and leave them in a better position to not just recover from the hurricane, but to actually start addressing the broader social and economic challenges they experienced on a daily basis. The first step in empowering communities? Well, it might just be getting to know your neighbors. Dennis Loncke: My name is Dennis Loncke, and I’m the Pastor of the Arverne Pilgrim Church. Tom Llewellyn: Located in the neighborhood adjacent to YANA, Pastor Loncke’s church was completely flooded when Sandy hit. He lost almost everything. But, just like with Sal’s nonprofit, there was a silver lining. Dennis Loncke: We met Terri Bennett about the third or fourth day after the storm. They came in and inquire of me, “What is this?” And we explained, “This is the church and the spot was the dining room. And they begin to say what was their purpose here. They come to help with the recovery. And so they made me an offer that I couldn’t refuse. They said, “Can we use your facility? We are not a big organization with money, but if we use your facility we will assist you to rebuild it.” And I says, “Hallelujah. Thank you Jesus.” And they were kind enough to do all and more than I had expected. They were the ones who literally refurbish and did all the work and get it back up and running. It was a hardship that sometimes you wonder why people go through this to help others. It was a sight to see for yourself. To see others who will give up themselves — literally give of themselves to get other people back in their homes. Terri Bennett: Pastor Dennis Loncke was someone that we worked with a lot in the Arverne section of the Rockaways. And so he’s a really good example of someone who saw his church destroyed — he had two homes that were both destroyed and saw the destruction of lots of his congregation’s homes. And so he also started interacting I think with a lot of people in the community he hadn’t necessarily interacted with before, in part because the Rockaways is a pretty segregated place. And so if you travel down the peninsula you can see that there’s one area of the Rockaways that actually I think may have the highest density of public housing in Queens, and then there are two gated communities on the peninsula, right? And so, people are segregated in a number of ways and maybe haven’t really interacted much before and seeing people transcend that I think was really important. And I think that that’s also not uncommon after a disaster. Sal Lopizzo: This was — I’m telling, I told him this was look like — when I walked in here it was like Home Depot [laughs]. Tom Llewellyn: We met up with Pastor Loncke and Sal at the Arverne Pilgrim Church. They were hanging out, just talking about the days and weeks after Sandy hit. Sal Lopizzo: We had a lot of really good meetings here, afterwards, right? Even did a play one night. Sal Lopizzo: We did a play, right? Some actors came in, they did like a little play. Sal Lopizzo: Yeah, it was a — you know what it was? It was really needed. Because people were in a lot of pain, and suffering, and struggling, and frustration, and then they could stop for a minute — you know? Sal Lopizzo: And just enjoy each other. Tom Llewellyn: Did you know each other before the storm? Dennis Loncke: No, we didn’t. Sal Lopizzo: No, we met each other after — during the storm. Dennis Loncke: During the storm. Sal Lopizzo: That’s what brought us together. Dennis Loncke: The storm really did unite in breaking some of the barriers down. Because most of us was living on opinion. Dennis Loncke: We assumed that the other person had the grass greener on the other side, so they had no need for this one, and that had no need for the other one. But when the storm came everybody’s opinion just disappeared with the storm. Sal Lopizzo: Yeah. Good way to put it. Dennis Loncke: So, we recognized that there are lots of people that had all different types of issues after the storm, and it was not just only the financial loss, or the the property loss. It was — it awakened the community to what is going on inside the midst of us. What we have as neighbors and stuff like that. Tom Llewellyn: We asked Terri if she had any advice to impart after her experience with Occupy Sandy. Terri Bennett: I do think that there are some things that you can do to make yourself and maybe people closer to you — at least in proximity — more prepared or more capable if you do have some kind of disaster. I think having organized neighborhoods helps. Being civically engaged helps. The best advice I can really give is knowing your neighbors, have people’s phone numbers, be able to get in touch, hopefully have them trust you, so that if you go in their backyard and you’re getting some kind of tool or something you have established those kinds of connections already. Tom Llewellyn: Right, so, things like preparedness kits and disaster mitigation technology are important parts of keeping communities safe during a crisis, but how effective can they be when resources in society aren’t distributed equitably in the first place? Without social intervention, the contours of a disaster will probably reflect pre-existing divisions — which are often shaped along race and class lines. So, like Terri suggests, maybe the best technology we can deploy is a kind of social technology: closely knit, organized, and empowered communities that are more resilient during catastrophes and that are better able to demand the resources they need to not only survive those acute disasters, but to thrive on a daily basis. As terrible as they can be, disasters present an opportunity to expand our social imagination and dream up new possibilities. Perhaps these events can open up a space that is normally closed off, a gap in which we can begin reclaiming community agency and power, an opportunity to tell a different story about who we are and what gives our lives meaning and purpose. For a few weeks at least, the driving narrative in the Rockaways was marked by altruism, solidarity and cooperation. And that shift in the mainstream story had lasting consequences. One can’t help but think, what if we structured our society along these lines normally? What if a mother begging for money in the streets evoked the same response as a hurricane? Can you imagine the impact? Sal was never able to get his workforce training center going again after the storm. He ended up handing the space over to a church, and nowadays he makes a living by driving for Lyft. But he’s not bitter. In fact, it’s quite the opposite. Sal Lopizzo: I definitely feel that if on a scale the good outweighs the bad, you know? That’s how I see it. I feel so grateful you know that this whole thing happened for me even though I had a different idea of which way it was going to go. But it still turned out pretty cool. You know, a lot of people got to see their own potential — and the potential of the community. And that’s what tragedies do sometimes. You know? That’s really where it’s at. Tom Llewellyn: This episode was written, produced, and edited by Robert Raymond. Interviews were conducted by field producer Paige Ruane, and recorded by Jack McDonald. A big thanks to Chris Zabriskie, Pele, and Lanterns for the music. Join us for our next episode where we’ll travel to Puerto Rico to explore how, in the aftermath of Hurricane Maria, a few spare dishes — along with a transformative vision — grew into a community kitchen which, in turn, has now grown into an island-wide movement with the goal of restoring power — both electric and civic — to the people. This season of The Response is part of the “Stories to Action” project, a collaboration between Shareable, Post Carbon Institute, Transition US, Upstream Podcast, and NewStories, with distribution support from Making Contact. Funding was provided by the Threshold and Shift Foundations. We don’t have much of a marketing budget for this project, so if you liked what you heard, you can head over to Apple Podcasts and give us a good rating. It might not sound like much, but it’ll make a huge difference. We’ll see you next time…in Puerto Rico.